Summer of 2017... It’s been an epic one—chock-full of family fun, exhilarating travel, and all-around adventure. We’ve been on-the-go, out and about, and enjoying every memorable moment. As the season winds down, we’re putting away our passports (at least, temporarily!) and settling into a calmer, more casual routine at home. Of course, that doesn’t mean we’re not going to enjoy or soak in every last sunny day, balmy night, and long weekend the summer has left to offer. Before the girls go back to school and our frantic fall schedules pick up speed, we’re going to relish in some much-needed poolside rest, relaxation, and outdoor entertaining… Friends, family, food, flowers, and fun in the sun—it doesn’t get much better than that! Are you, too, planning a Labor Day shindig or sizzling end-of-summer soirée? I’m sharing my top five tips to ensure easy entertaining at home—and a delightful experience for all your guests! An open airy home is always inviting. Of course, it’s nearly impossible to have a completely clutter-free interior with children in the picture. “Stuff aside, you can have a sparkly clean (and practically germ-free!) abode with a little help from Clorox. We always have Clorox® Regular Bleach2 on hand and at the ready for all our cleaning needs. It’s great for sanitizing, deodorizing, and disinfecting, and we use it regularly in our kitchen and bathrooms, on the patio, and just about anywhere inside and outside the home. TIP: As you prep the house for a party, don’t forget that there are areas of the home that can get extra germy and, thus, require extra attention. Use your Clorox® Regular Bleach2 to clean and disinfect frequently touched hard surfaces (i.e. bathtubs, sinks, countertops, and cutting boards). It’s simple—pour 1/2 cup of Clorox® Regular Bleach into 1 gallon of water. Thoroughly wet your surface with the solution, let sit for five minutes, rinse with clean water, and let it air dry. Nothing brightens up the home like fresh flowers. Colorful, bold blooms bring life to any room. Sunflowers are in season—and the peppy pop of yellow instantly exudes an effortlessly upbeat vibe. Display them in vases or mason jars in bathrooms, guest rooms, and all throughout the home. Simple, pretty, and fail proof! 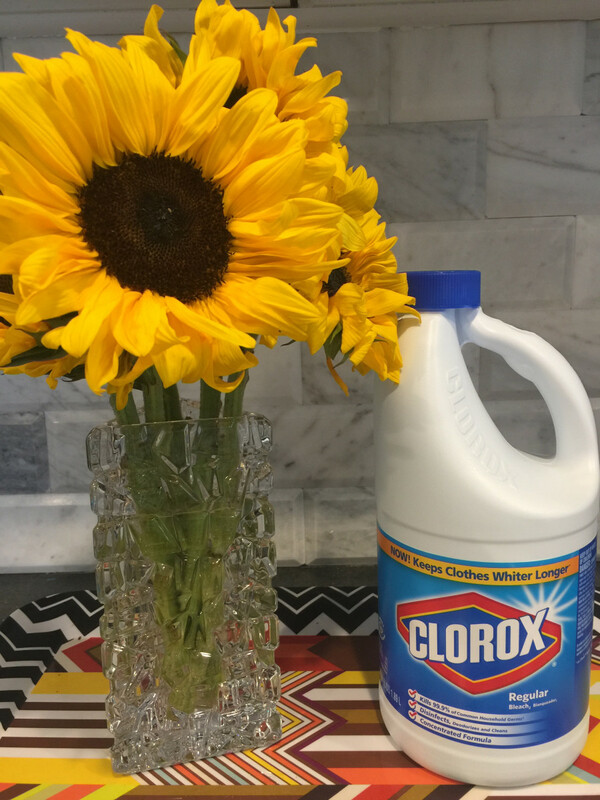 TIP: Fresh cut flowers will stay beautiful longer if you add 1/4 teaspoon of Clorox® Regular Bleach2 to each quart of cold water. It can also be used to remove flower-vase stains and odors. 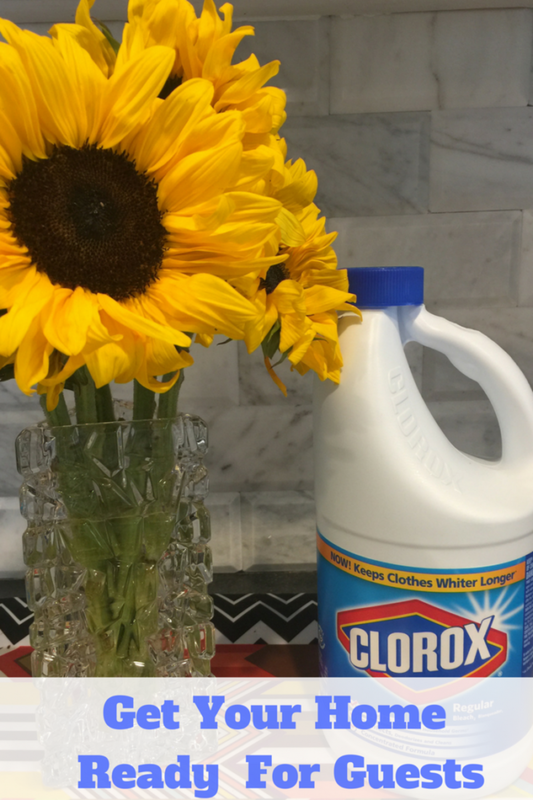 Wash the vase thoroughly before filling with a solution of 1/2 cup bleach to 1 gallon water. Let this stand for five minutes and rinse. Cleaning flower containers will help prevent the transfer of molds and diseases from old plants to new ones. Are your guests staying overnight? Make sure to have plenty of designated towels conveniently laid out for them in the bathroom they’ll be using. Providing extra personal amenities—like new toothbrushes, toothpaste, and even luxury toiletries—is a nice touch that will make friends feel right at home. 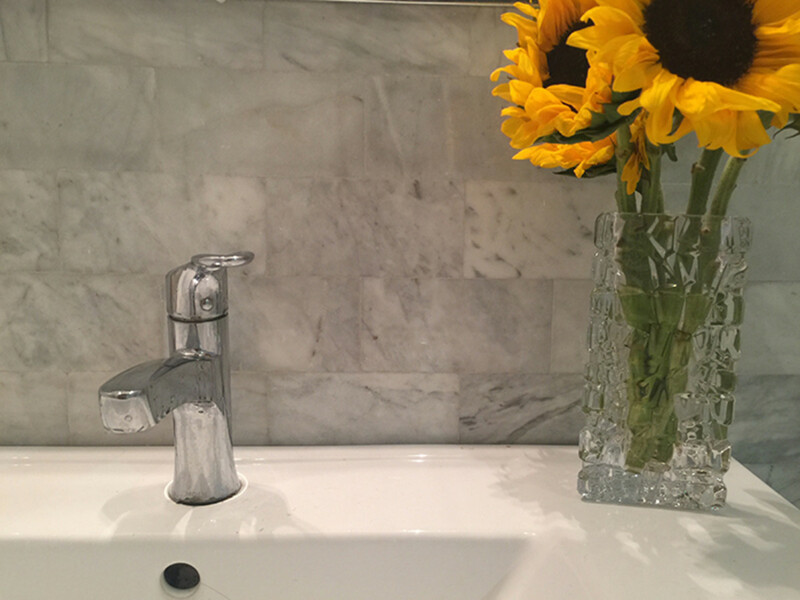 TIP: Keep your bathrooms sparkly (and reduce mold!). Be sure to check problem spots often for moldy odors, and disinfect frequently with a solution of 3/4 cup of Clorox® Regular Bleach2 diluted in 1 gallon of water. Barbecue season is fleeting—enjoy every last sticky rib, seasoned wing, flamed fish, and marinated steak. When entertaining during the summer months, we prefer to keep it simple. We do some serious grilling, and keep the kitchen cooking to a minimum. A nice salad made with garden-plucked veggies and sliced fresh fruit, and dinner is served! 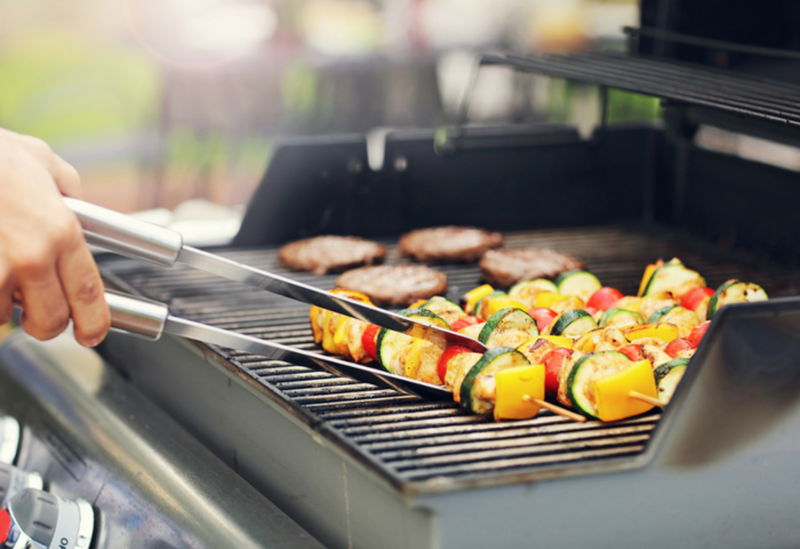 TIP: While the majority of your barbecue cooking will take place outdoors, plenty of preparations will happen in the kitchen, on your countertops, and on those cutting boards. Take necessary precautions: use a different platter for raw meat and cooked meat, and avoid porous wooden cutting boards, when possible. 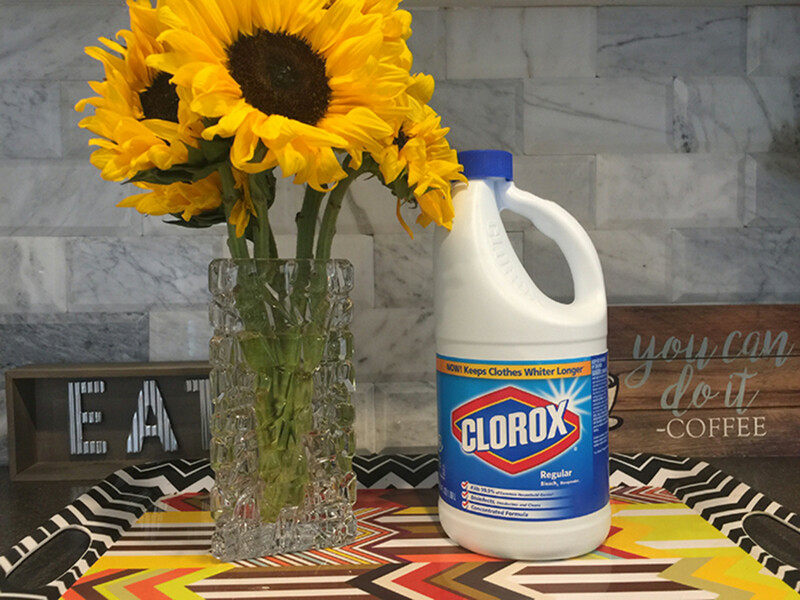 Sanitize all food prep surfaces with Clorox – just 2 teaspoons of bleach mixed with one gallon of water to sanitize – and help keep your friends and family safe from food-borne illnesses. Soon enough, the weather will cool down. But, for now, we’re still feeling the heat and humidity! Embrace the sizzle with some summer-inspired outdoor activities. A pool party is always a hit—especially when you have fun floaties to jazz up the scene. Tip: Clorox® Bleach is great for chlorinating those small wading pools that often sit outdoors, unused, and exposed for weeks at a time. As a general rule of thumb, you’ll want to use 1/8 cup or 6 teaspoons of Clorox® Regular Bleach2 per 100 gallons of water (i.e. an 8-foot diameter pool holding 1 foot of water would require 20 tsp. of product). Be sure to dump the pools out daily.